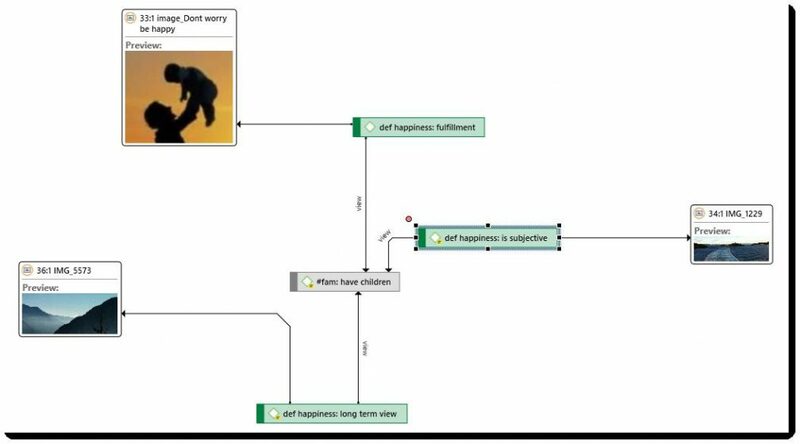 ATLAS.ti is a powerful qualitative analysis software offering the greatest variety of tools for accomplishing all the tasks associated with a systematic approach to unstructured data, i.e. data that cannot be meaningfully analyzed by formal, statistical approaches. It helps you to explore the complex phenomena hidden in your textual and multimedia data. For coping with the inherent complexity of the tasks and the data, ATLAS.ti offers a powerful, intuitive environment that keeps you focused on the analyzed materials. It is a tightly integrated suite of tools that support your analysis of written texts, audio, video, and graphic data. The integration of its tools is designed to perfectly support the work flow of the qualitative researcher. Hence, ATLAS.ti brings to the job highly sophisticated tools to manage, extract, compare, explore, and reassemble meaningful segments of large amounts of data in flexible and creative, yet systematic ways. The image of our software as a “knowledge workbench” is more than just a lively analogy. Analytical work involves tangible elements: research material requires piecework, assembly, reworking, complex layouts, and some special “tooling”. A well-stocked workbench provides you with the necessary instruments to thoroughly analyze and evaluate, search and query your data, to capture, visualize and share your findings. A typical project deals with sifting through large sets of diverse documents, notes, and multi-media files, and examining and comparing such sources regarding a specific line of inquiry. While the technical side of selecting, and organizing useful portions of your data might seem manageable when dealing with just a handful of source documents, it can tend to become overwhelming as the number of sources mount. Enter a specialized software package like ATLAS.ti: It lets you extract, categorize, and interlink data segments from a large variety and volume of source documents. Based on your analysis, the software supports you in discovering patterns and testing hypotheses. With numerous output options and collaboration tools, your analysis is easily accessible to yourself and others. To understand how ATLAS.ti handles data, visualize your entire project as an intelligent “container” that keeps track of all your data. This container is your ATLAS.ti project. The project keeps track of the paths to your source data and stores the codes, code groups, network views, etc. that you develop during your work. Your source data files are copied and stored in a repository. The standard option is for ATLAS.ti to manage the documents for you in its internal database. If you work with larger audio or video files, they can be linked “externally” to your project to preserve disk space. All files that you assign to the project (except those externally linked) are copied, i.e. a duplicate is made for ATLAS.ti’s use. Your original files remain intact and untouched in their original location. Your source data can consist of text documents (such as interviews, articles, reports); images (photos, screen shots, diagrams), audio recordings (interviews, broadcasts, music), video clips (audiovisual material), PDF files (papers, brochures, reports), and even geo data (locative data using Open Street Map). Once your various documents are added or linked to an ATLAS.ti project, your real work can begin. Most commonly, early project stages involve coding different data sources. Coding is the basic activity you engage in when using ATLAS.ti and is the basis of everything else you will do. In practical terms, coding refers to the process of assigning categories, concepts, or “codes” to segments of information that are of interest to your research objectives. We have modeled this function to correspond with the time-honored ATLAS.ti 8 Windows – Quick Tour BASIC CONCEPTS 7 practice of marking (underlining or highlighting) and annotating text passages in a book or other documents. In its central conceptual underpinnings, ATLAS.ti has drawn deliberately from what might be called the “paper and pencil paradigm.” The user interface is designed accordingly, and many of its processes are based on—and thus can be better understood by—this analogy. Because of this highly intuitive design principle, you will quickly come to appreciate the margin area as one of your most central and preferred work space—even though ATLAS.ti almost always offers a variety of ways to accomplish any given task. ATLAS.ti offers numerous functionalities that are either completely unique or clearly stand out from the rest of all QDA software packages out there. Here are just a few. 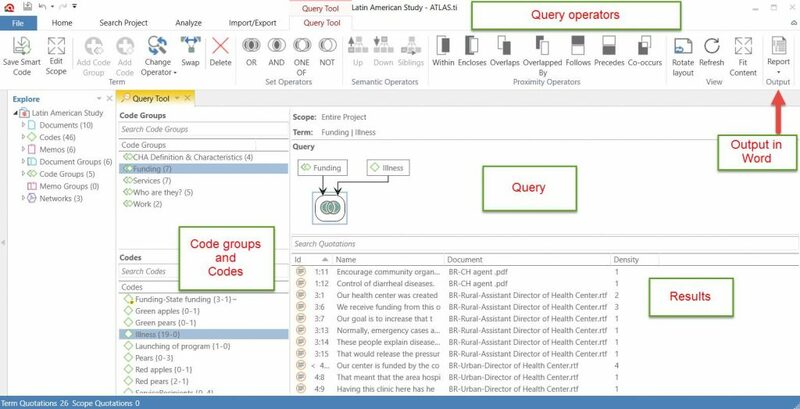 Meaningful Coding Hierarchies: The ATLAS.ti Object Explorer is a clickable tool that lists all work and connections between documents and their quotes. It shows connections of every code with every other code and provides sophisticated views of the coding scheme ( including all the interconnections). Of course, hierachical views of the coding scheme are also possible. 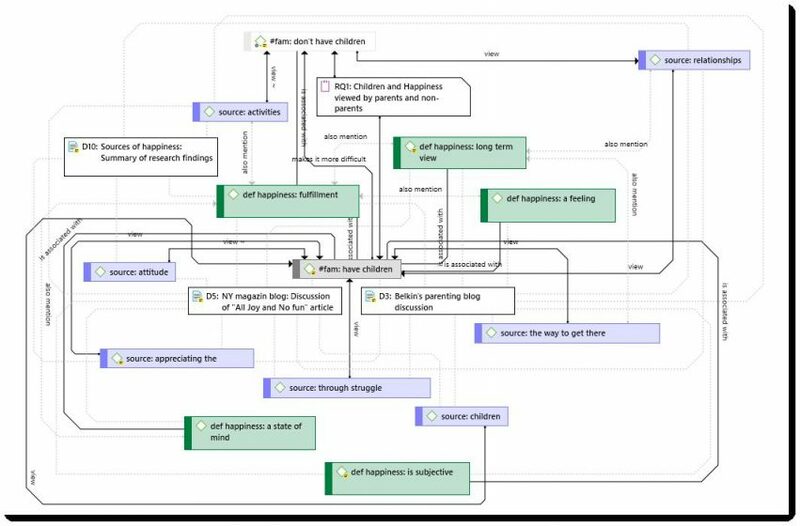 Transitive Relationships: A unique and extremely powerful feature of ATLAS.ti is its capability of letting you define functional relationships, embodied in transitive (or hierarchical) links, such as ‘is a’, ‘part of; ‘causes’ etc. Its powerful Query Tool lets you retrieve data based on transitivity. 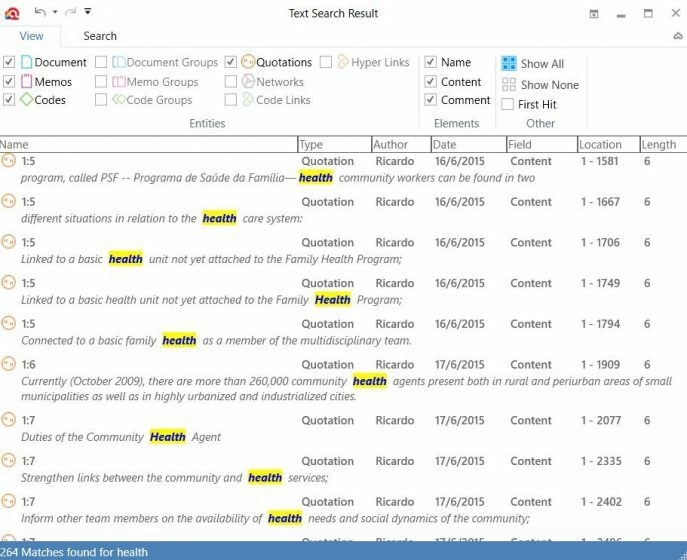 Flexible Searching / Retrieving / Filtering: ATLASti makes it quick and easy to focus attention on parts of the dataset without even opening its dedicated search tools. Double clicking on code and/or document families filters your work in various ways, providing great insight into the dataset without . Codes can be sorted in multiple ways in ATLAS.ti; this adds great flexibility to the ways information about progress and frequency can be produced. < ATLAS.ti sports powerful search & retrieve functions with Boolean, semantic, and proximity-based operators. Searches always locate coded quotations in context which keeps you very close to the source data at all times. Comprehensive Annotations: ATLAS.ti gives you numerous different ways to fully annotate your material. Attach extensive comments (even containing multimedia and embeded objects!) to any program object, i.e. quotations, documents, codes or networks. Or create standalone memos that become automous objects and are centrally listed, accessible and searchable. Powerful Hyperlinking: Hyperlinking allows for precise point-to-point jumping around the dataset at text level. ATLAS.ti enables this very effectively for both text and multimedia, e.g. audiovisual data. In text the hyperlinks flagged in the margin view are easily navigated by clicking. No doubt, ATLAS.ti is a sophisticated and complex piece of software. However, despite its many formidable capabilities, independent testers have praised it to be “very interactive and flexible” (Lewins/Silver, p.) as well as easy to get started with. Nearly all activities that you will need to perform in ATLAS.ti are based on drag and drop: Linking, coding, and merging, use of the data managers and last but not least its fully interactive margin area are extremely user-friendly and work just the way you would expect it. There is simply no more intuitive and no more efficient way of working than the one you’re already used to from countless Windows applications. A great manual and a live help system, easy-to-follow quick start instructions and especially a growing library of online video tutorials help you get started without too much trouble. Our much-praised online support is included in the price of every license. And if you still feel you need more or more specific guidance, numerous independent trainers offer dedicated workshops all over the world. Interface: Any combination of functions can be open together, which allows equally for extremely comfortable and efficient work. A major independent study specifically praised ATLAS.ti for its “slick interactivity between different objects and tasks” which contributes to the high degree of “fluidity with which you can flick between views and functions.” (Lewins/Silver, p.) Unlike other programs, ATLAS.ti employs line wrapping of text when the window size is reduced. Interactive Margin: ATLAS.ti introduced the classic margin view as early as 1996. It is ATLAS.ti’s perhaps most central work view, and it facilitates work by providing an extremely intuitive environment that emulates a traditional paper-and-pencil feel. Your codes are conveniently in view at all times, even appearing simultaneously as you code. Its ability to let you choose between viewing codes, memos or hyperlinks, or combinations of them is unique to ATLAS.ti and makes it the most intuitive and most flexible QDA tool out there. Navigation, Units of Context: ATLAS.ti displays the widest variety of units of context while at the same giving you the most precise text segments at the lower levels (word, sentence, paragraph). Clear and concise points of reference (such as line and paragraph numbers) always make moving around–even large documents–easy. ATLAS.ti is fully teamwork-oriented and puts special emphasis on supporting group work. Its project merging capability is superior to that of any other QDA software because ATLAS.ti uses a stronger and more rigorously designed authorship model than anyone else. Each object is clearly assigned to an author, allowing for flexible merging, filtering, and multiplication of projects. And ATLAS.ti’s strong authorship rights model also supports a concise security model. Merging a project from a multitude of sources–local or remote!–is just as you would expect: straightforward, logical, and simple. Various tools and functions make collaborative work a breeze–all the more when you consider that collaboration in most cases means several individuals primarily working separately on independent aspects of a problem. The crucial point is the software’s ability to exchange work between users and to merge contributions into a larger context. ATLAS.ti has highly developed, powerful functions to perform all of these tasks reliably. 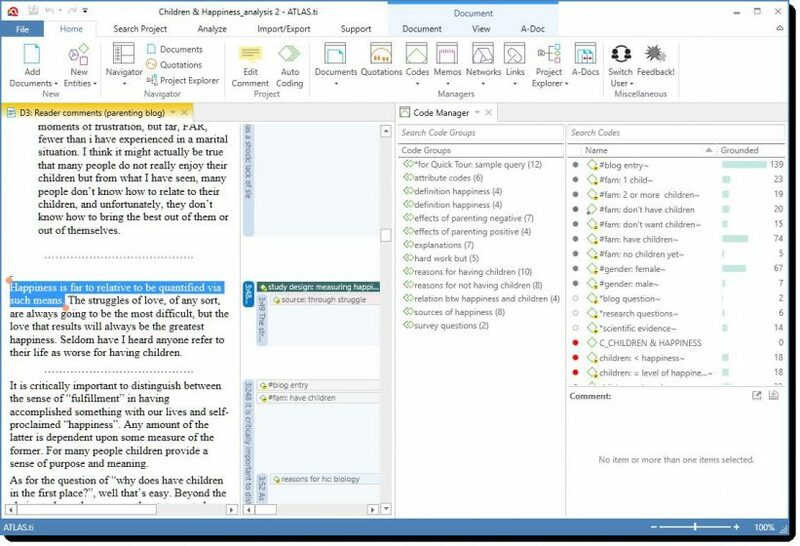 Its Merge tools and its Copy Bundle function, along with its support for data access on remote drives and even through VPN, help you to master all aspects of collaborative project management and flexibly support the way your research team likes to work. ATLAS.ti understands the necessity to sometimes re-use research results for processing and publication in other applications. It therefore sports the widest range of export and reporting facilities of any QDA package. SPSS, Excel, and HTML are standard export formats for your projects. But they by no means exhaust the possibilities for integration with your IT demands. 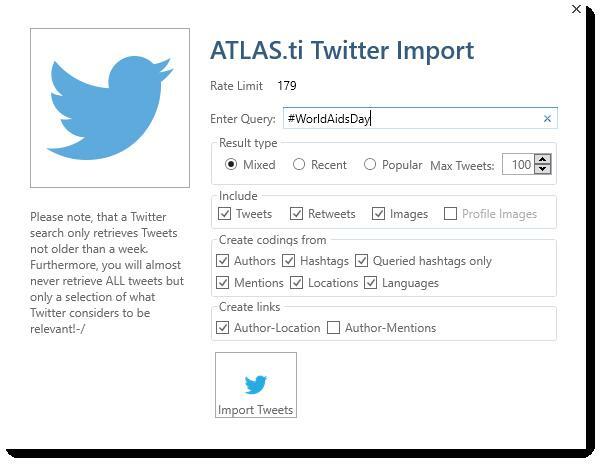 Through its native XML output and and assisted by an extensive number of XSLT-filters that come included in the package, ATLAS.ti can export your complete data to virtually ANY application. By supporting the open standard XML, ATLAS.ti is the first QDA tool to create a platform for the universal exchange, storage, and processing of QDA data. Formats that can be supported by implementing this standard are as manifold as their intended purposes: Elegant reporting on- and offline, professional pre-print, conversion into the most diverse application formats, and many more. ATLAS.ti comes with several dozens filters for reporting, exchanging data between users, and export to application formats, all of which can be modified and adapted by users to suit their specific purposes. Custom programming services are also available. ATLAS.ti is known for its long upgrade cycles (we release major versions only every few years), but also for its active update policy that always gives you that latest available developments–for free! We release numerous free updates and minor version upgrades each year, almost all of which are not mere “bug-fixes” but add significant new functionality. Typically, there are somewhere between 10 to 20 “mini-upgrades” during the life-cycle of a major version. What others tout as new versions (and charge users for are considered included in the initial purchase price. Your software keeps “growing” and adapting to new developments for years to come–all free of charge to you. When we do release major versions, they present significant steps forward and introduce powerful, innovative, and elegant new paradigms not available anywhere else. Simply German engineering at its best. ATLAS.ti 8 Windows represents a paradigmatic shift towards the future. This shift is represented in a new interface, a change from being an object-oriented application to one that is function-oriented; the move from menus to ribbons. The interface of ATLAS.ti 8 Windows has changed. The top hanging menus have been replaced by a system of ribbons. Some of those ribbons are contextual in the sense that they are dependent on the current selected item in the application. For example, once a document is loaded and a segment is selected, the options for creating and commenting quotations, coding and other related tasks are activated. 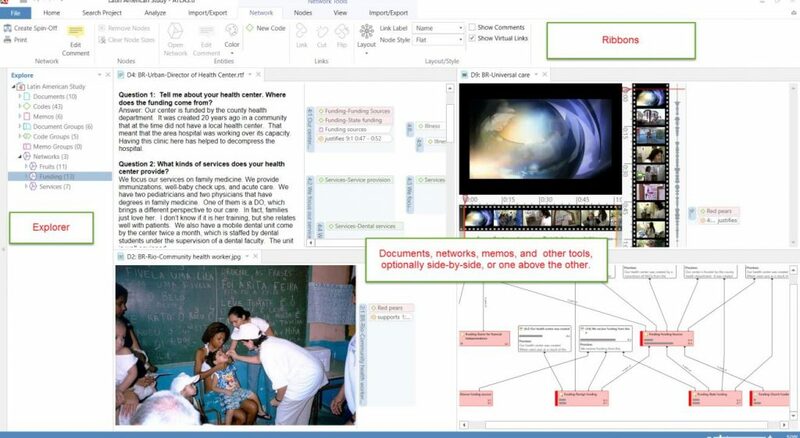 The image below shows a general view of the interface with documents and a network opened side-by-side. There are five core tabs, as shown below: Home, Search Project, Analyze, Import/Export and Support. Additionally, there is the ribbon backstage under File that gives access to the options for information on the project, to create a new project, save and save as the project, merge two projects, export the project, close it, exit it and other options. When you first open a manager or other windows, they will be opened in floating mode. All windows can however also be docked and depending on what you are currently doing, you may prefer a window to be docked or floated. Once you have docked a window. ATLAS.ti will remember this as your preferred setting for the current session. If you open two or more documents, they are loaded into tabs in the main work space. The tab of the currently loaded document is colored in yellow. This can also be done with any other items you open, be it your list of codes, a memo, or a network. Below you see the docked Code Manager and a document side-by-side. Given sufficient screen space, you could also add a region at the bottom of the screen for instance to display a memo. Under ‘Search Project’, you will find a powerful Keyword in Context tool, an improved version of the former Object Crawler found in ATLAS.ti 7 and earlier. 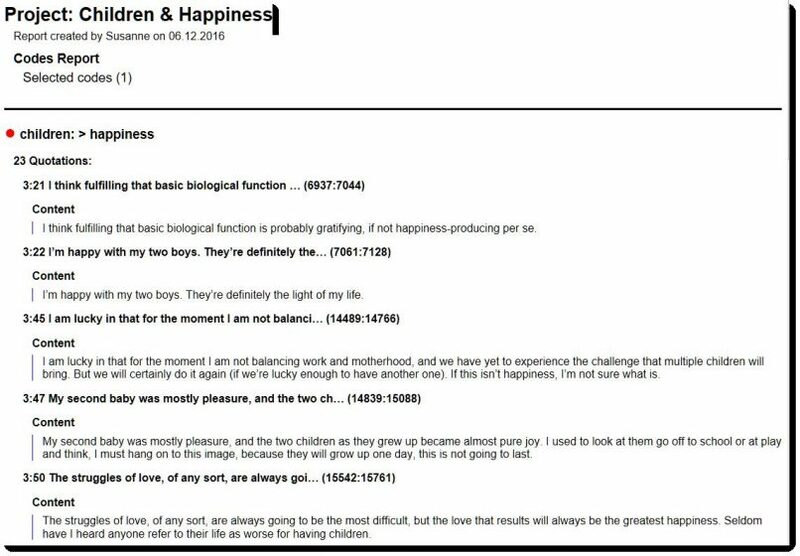 Here you can search for specific words or combination of words, and look for them everywhere in the project: documents, memos, codes, document groups, memo groups, code groups, quotations, networks, code links and hyperlinks. The results of the search are listed in an interactive list, where you can click on a specific hit and you will be able to see the term within its larger context. See the result list below. Under the Import/Export ribbon tab (see below), you will find the following options: importing data from Twitter, Evernote, reference managers (e.g., Endnote) and survey data. Also, here you will find the option to export the project in SPSS format. You do not have to have a Twitter account of your own to import Twitter data. After starting the Twitter Import took, you enter a query, e.g. searching for a hashtag. You can also look for multiple hashtags or authors by using OR. For example: #WordAidsDay|#HIV|#Aids. Further options are to select the most recent or the most popular tweets and whether to include retweets, images and profile images. The imported data is automatically coded based on the selection you make. Tweets often contain many more hashtags then the original one you searched for. Coding all hashtags often results in a lot of codes. Therefore you have an option to only code the queried hashtags. Further options are to code all authors and all mentioned Twitter users, the location and the language. Lastly you can decide whether a link should be created between authors and locations and between the authors and mentioned Twitter users. Note that you only will not be able to import tweets older than one week. Queries at different times or on different computers may results in different tweets, as the final selection is done by Twitter and not within our control. 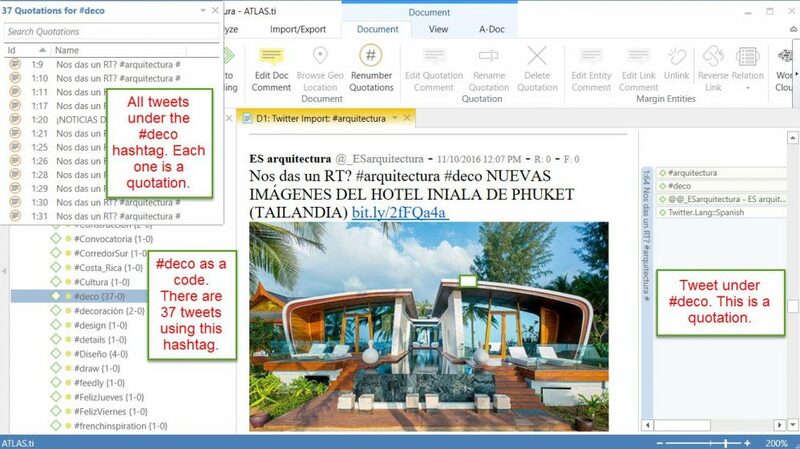 The result of the importation will produce a single document with all tweets and a set of codes for the hashtags, the author, the language of the tweet and the location from where the tweet was made. The tweets themselves become quotations. So, for example, all of the tweets under the hashtag ‘#Deco’ will be quotations linked to that code. Tweets can be visualized graphically using one of the 11 automatic node layouts that come with ATLAS.ti 8 Windows. These networks show the linkages between authors, mentioned authors, hashtags, locations, languages and actual tweets. This provides a holistic view of the Twitter social networks. See an example below. You can import your notes from Evernote libraries. Each note becomes a document in ATLAS.ti. 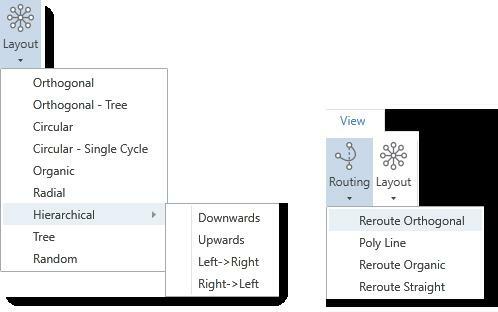 Once imported, you can proceed to work with it as you would with any document: segment it, code it, annotate it, diagram it, and so on. See below some document imported from Evernote. This option allows you to import data from any reference management software such as Endnote, Zotero, Mendeley and Reference Manager. 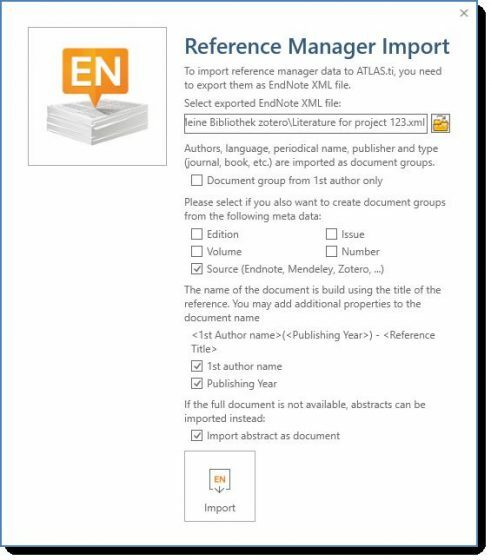 The prerequisite is that your Reference Manager can export your bibliographic records as ‘Endnote XML Export File’. Once that is done, they can be imported into ATLAS.ti. Each one of the bibliographic records (e.g., journal articles) will become a single document in ATLAS.ti. If the record has an attached PDF, the PDF will be the ATLAS.ti document, and if it does not, you have the option of having the abstract become the document. All documents will be grouped according to authors, language, periodical name, publisher and type (e.g., journal or book). This will allow you to interrogate the bibliographic data according to any, or a combination of, these attributes. Additionally, you are given the option of grouping the documents according to edition, volume, source, issue and number. You also have the option of naming each document by the first author’s name and the publishing year. 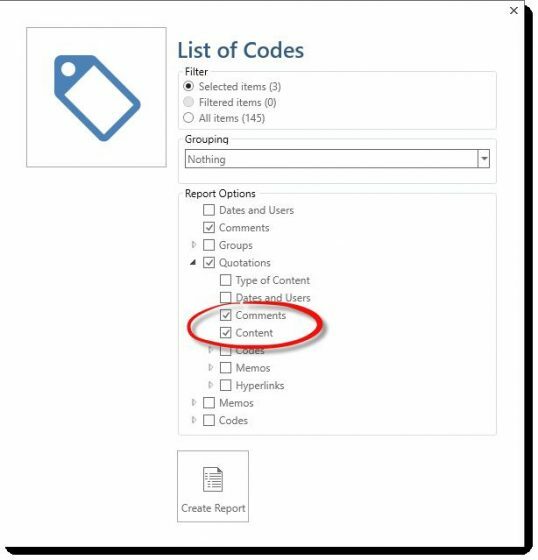 Once imported, you can proceed to segment and code each bibliographic record as you would any other document of your project. 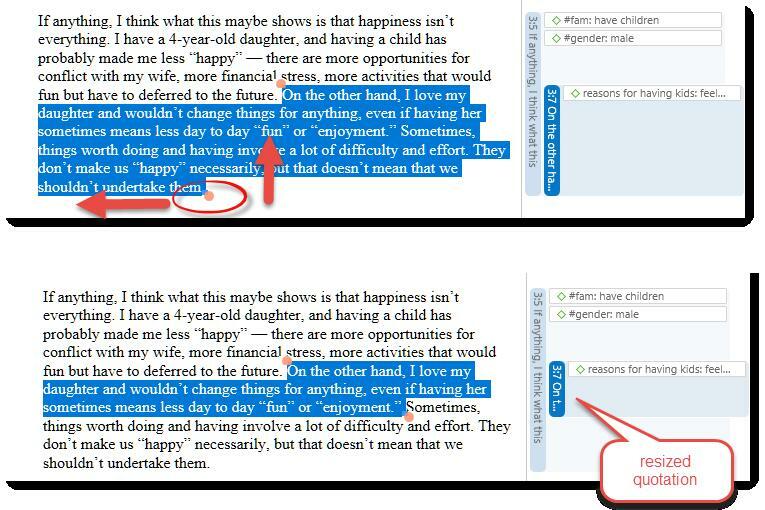 The notes you wrote in association to your articles will show in ATLAS.ti as document ‘comments’. 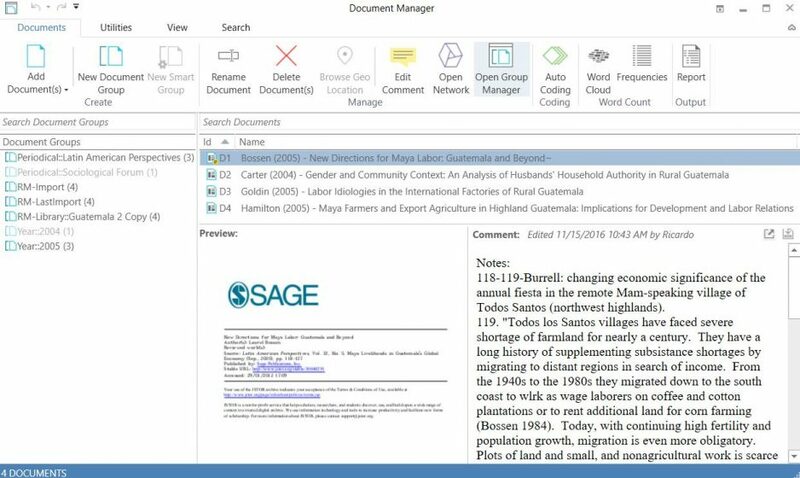 The figure below shows the Document Manager with the imported records (i.e., documents, the preview and the comment. Quotations now have ‘handles’ (orange dots) that makes the quotation boundaries easy to see and also easy to modify. You simply need to drag the handles to a different position to modify the length of a quotation. This works for all media types. The full quotation can now be preview in the Quotation Manager. This applies to all text, PDF and image quotations. The comment field is next to the preview area, which allows you to write comments whilst reading through your quotations. Quotation Retrieval windows can be docked on the right or left-hand side of your screen. This facilitates the process of reviewing your quotations in context. Splitting a code is necessary if you have been lumping together many quotations under a broad theme. At some point, however, those codes need to be split up into smaller sub codes. This procedure is now much better facilitated with the new Split Code tool. 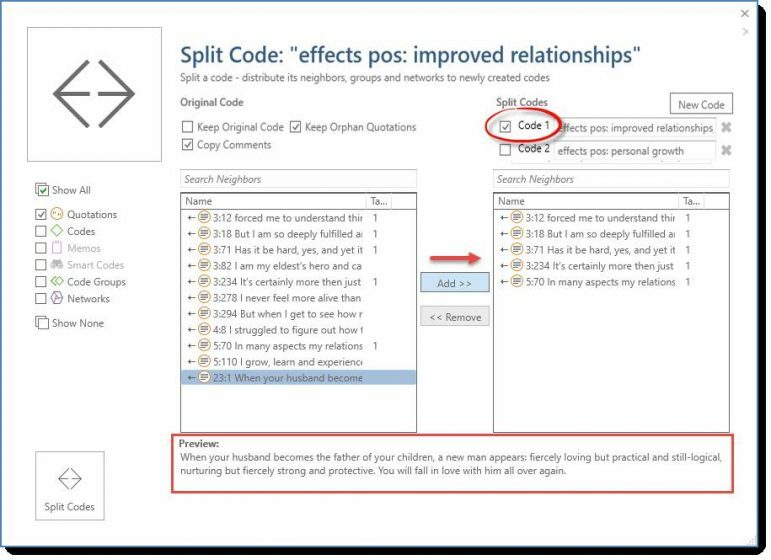 In the Split Code dialogue, you see a list of the quotations coded with the code that was selected for splitting and all other related entities. ATLAS.ti be default creates two sub codes, but you can add more when you click on the New Code button. Further options are to keep the original code including the quotations or without them. Before you decide which quotation goes into which sub code, you can read it in the preview area, or in the context of the data. A quick way to get a feeling for the content of a text document is by creating a word list or word cloud. Word clouds in A8 are colored and in addition to displaying word clouds for document, you can also create word clouds from coded content. 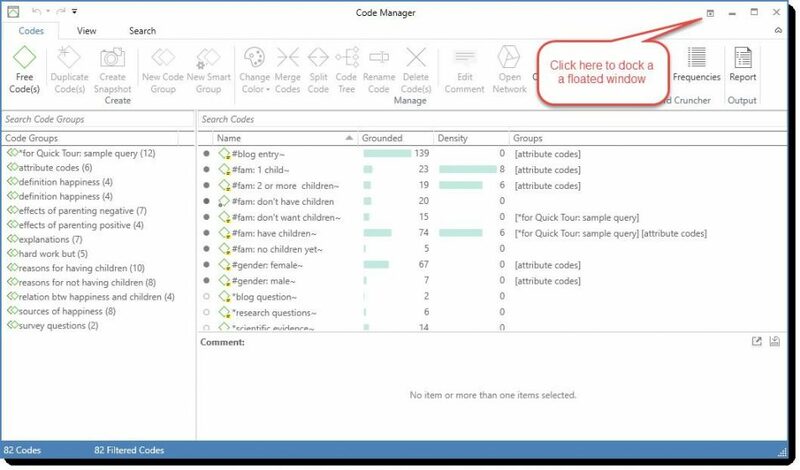 Under the Analyze tab, you will find the Query Tool, the Code Co-occurrence Explorer and Table, and the Code-Document-Table. The Query Tool deserves a few extra words. This tool has been redesigned completely vis-à-vis version 7 and earlier. There is a graphic interface that facilitates the creation of queries, still using Set, Semantic and Proximity operators, as well as allowing for the specification of the scope of the query (i.e., the subset of documents where to conduct the query). 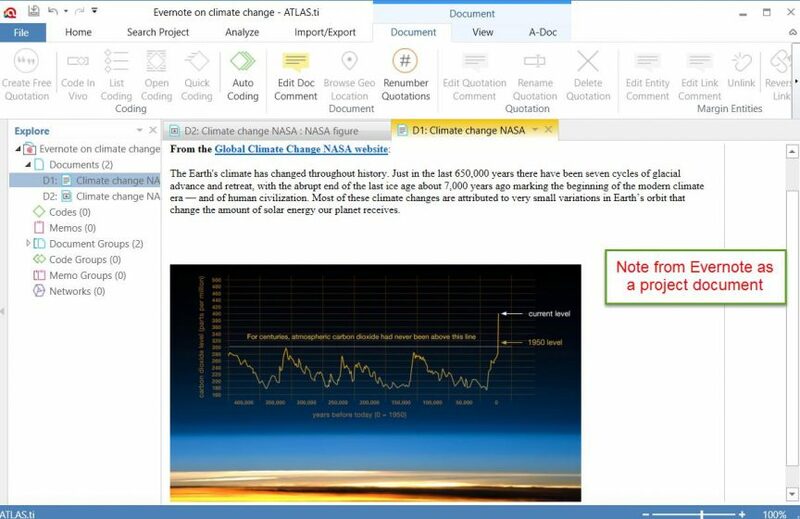 The reports are now directly in Word or equivalent and the user is in control over what to include in that report. To create the network below, the Organic layout was used in combination with Poly Line. To save a network in the Microsoft XPS format, select the EXPORT XPS option. The XPS format is Microsoft’s alternative to PDF. If you want to create a PDF file, make sure a PDF writer is installed on your computer. If so, you can select the PRINT option and chose your PDF Writer as printer. ATLAS.ti 8 in addition to providing predefined reports also offers user configurable reports. This means you can decide what should be displayed in the report. Predefined reports are available in the Query Tool under the Report button. You can now select how the output is sorted. The default sort order is by code. If you select multiple codes from different code groups, you can chose to group the output by code groups. Or if work in a team, you may want to view the quotations by creating or modifying user. Given the selections made above the output will contain the code name, the code comment, all quotations linked to this code, their comments and content. If you do not select the content option, only the quotation ID and and name are included in the report. If you are familiar with the XML export options in ATLAS.ti 7, these are not yet available in the initial release version. However, they are expected to be included in version 8.1 (second quarter 2017). CONDIZIONI GENERALI DI CONTRATTO COMMERCIALI DI CLEVERBRIDGE AG E DI CLEVERBRIDGE, INC.
cleverbridge AG, Gereonstr. 43-65, 50670 Colonia (Germania), e cleverbridge Inc., 350 N Clark St Suite 700, Chicago, IL 60654, USA, entrambe per brevità di seguito denominate “cleverbridge”, sono imprese internazionali operanti nel commercio elettronico. 1.1 “Imprenditore” significa qualsiasi Cliente che intraprenda una transazione legale nel corso della propria attività commerciale, del proprio business o della propria professione. 1.2 “Sito web di cleverbridge” indica ogni sito Internet gestito da cleverbridge per la vendita di prodotti e servizi e contraddistinto, inoltre, dalle CGC e dalle note legali di cleverbridge. Le pagine web gestite da Fornitori sono espressamente escluse da questa definizione. 1.4 Per “Cliente” si intende qualsiasi persona fisica o giuridica o partnership in possesso di capacità giuridica che effettui un ordine per Prodotti e Servizi su un Sito web cleverbridge. Il termine Cliente, salvo diversamente stabilito, farà riferimento sia ai Consumatori che agli Imprenditori. 1.5 I “Prodotti” indicano (a) codici di decifrazione o autorizzazione, numeri di serie o di autorizzazione, un link per il download, oppure un codice simile o un meccanismo simile che fornisce al Cliente il primo o il continuato utilizzo di un Software o un Servizio, o (b) altri prodotti (anche fisici). 1.6 “Servizio” indica tutti i servizi del Fornitore venduti da cleverbridge al Cliente tramite il Sito web di cleverbridge. 1.7 “Software” indica i programmi per computer dei Fornitori commercializzati in qualsiasi forma o supporto tramite il Sito web di cleverbridge. 1.8 “Abbonamento” indica i Prodotti o Servizi con obblighi di pagamento ricorrenti (“Abbonamenti”). I pagamenti sono dovuti nel periodo/nei periodi concordato/i. 1.9 “Periodo di pagamento dell’abbonamento” indica i periodi concordati per il pagamento degli Abbonamenti. Le presenti CGC si applicano a tutte le offerte, accettazioni di offerte, erogazioni in rete, prestazioni e forniture da parte di cleverbridge o al Cliente nell’ambito della vendita di Prodotti e Servizi attraverso un Sito web di cleverbridge, in base alle definizioni di cui alle Clausole 1.5 e 1.6. Eventuali termini in deroga da parte del Cliente o di terzi diverranno parte del presente contratto soltanto previa accettazione scritta da parte di cleverbridge. Le presenti CGC sono valide anche quando cleverbridge, pur a conoscenza delle divergenti condizioni del cliente, esegue senza riserve le proprie prestazioni. Se la vendita di Prodotti e Servizi comprende la fornitura di Servizi o di altre prestazioni di terzi, oltre alle presenti CGC valgono le speciali condizioni di licenza e le altre condizioni dei terzi. 3.1. Un ordine trasmesso dal cliente costituisce un’offerta indirizzata a cleverbridge per l’acquisto di Prodotti e Servizi, in accordo con le presenti CGC. Tali ordini sono soggetti alla successivaaccettazione da parte di cleverbridge. L’ordine del Cliente viene accettato mediante conferma espressa o, al più tardi, mediante la fornitura dei Prodotti e Servizi ordinati. 3.2. Nella fornitura delle proprie prestazioni, cleverbridge è libera di fornirle a propria scelta anche a terzi. Il Cliente garantisce che i propri dati relativi all’ordine forniti dallo stesso (compresi, senza limitazione, i dati personali e i dati di pagamento) sono aggiornati e pertinenti in tutti i loro aspetti principali. I costi derivanti da qualsiasi dato non corretto fornito dal Cliente o da qualsiasi dato rettificato dal Cliente successivamente all’inoltro dell’ordine del Cliente saranno sostenuti da quest’ultimo. Qualora il Cliente disponga di un account cliente cleverbridge, è responsabilità dello stesso mantenere ed aggiornare prontamente i dati del suo account per garantirne la costante e continua correttezza e completezza; il Cliente deve assolutamente mantenere segreta la password di accesso all’account cliente e non rivelarla a terzi per alcun motivo. 5.1. Qualora per l’acquisto, il trasporto o l’uso di Prodotti e Servizi sia necessaria una licenza da parte di un governo o altra autorità, spetta al Cliente richiederla a proprie spese e, su richiesta, presentarla a cleverbridge. Il mancato adempimento di tale obbligo non legittima il Cliente a trattenere o ritardare il pagamento della merce. Tutti i costi e le spese sostenuti da cleverbridge a causa di tale inadempimento, o di una richiesta erronea, sono a carico del Cliente. Per il Consumatore questo non si applica riguardo a un’autorizzazione o ad un altro nulla osta per il trasporto. 5.2. I Prodotti e Servizi gestiti da cleverbridge, e messi a disposizione del Cliente elettronicamente o fisicamente, possono rendere accessibili al Cliente tecnologie e Software che sono soggetti alle norme di controllo delle esportazioni della Repubblica Federale di Germania, degli Stati Uniti d’America o di altri Paesi, nei quali detti Prodotti e Servizi vengono venduti o utilizzati. Il Cliente si obbliga a rispettare le norme di controllo delle esportazioni. cleverbridge è legittimata al recesso nel caso in cui il Cliente violi le norme di controllo delle esportazioni. 5.3. In caso di superamento di un determinato valore della merce, l’introduzione delle stesse nello Spazio Economico Europeo può comportare spese doganali (per es. se il valore della merce eccede il limite d’importazione personale del Cliente). All’arrivo della merce nel luogo dallo stesso stabilito, al Cliente può venire imposto dalle autorità competenti il versamento dei diritti doganali, dei dazi di importazione e delle imposte. Tutti questi costi aggiuntivi sono a carico del Cliente, poiché si trovano al di fuori del controllo di cleverbridge e non sono noti alla stessa. Il Cliente può ricevere informazioni più dettagliate sulle norme doganali o sulle tasse dall’ufficio doganale responsabile per la sua giurisdizione. 6.1. Il pagamento del prezzo d’acquisto è esigibile direttamente alla conclusione del contratto e deve aver luogo nei modi indicati sul Sito web di cleverbridge. Ad esclusione degli ordini di acquisto e dei prodotti in abbonamento, i pagamenti devono avvenire prima delle consegne. Per i prodotti in abbonamento i clienti vengono fatturati automaticamente agli intervalli indicati sul sito web cleverbridge. Laddove il Cliente abbia acquistato un Abbonamento lo stesso dovrà, allo scadere di ciascun Periodo di pagamento dell’abbonamento, corrispondere il prezzo dell’Abbonamento oppure rendere disponibile il corrispondente prezzo di acquisto utilizzando l’opzione di pagamento convenuta tra il Cliente e cleverbridge. Per gli Imprenditori si applicheranno le seguenti disposizioni: Nel caso in cui il Cliente sia un Imprenditore, lo stesso dovrà rivelare la propria identità commerciale nel momento in cui effettua l’ordinazione. cleverbridge può considerare l’indirizzo fornito come sede commerciale dell’Imprenditore, salvo diversamente indicato. Nel caso in cui la partita IVA dell’Imprenditore sia registrata in un altro Paese, cleverbridge potrà anche impiegare tali informazioni a scopo fiscale. cleverbridge applicherà delle tasse nella misura richiesta dalla legislazione in materia. cleverbridge potrà applicare e addebitare della tasse successivamente al pagamento per i Prodotti e Servizi effettuato dall’Imprenditore in conformità alla Clausola 6.1. L’Imprenditore è pertanto tenuto a corrispondere successivamente il rimanente importo relativo alle tasse a cleverbridge. Inoltre, in qualità di destinatario dei Prodotti e Servizi, l’Imprenditore potrà avere l’obbligo di rimettere l’IVA, le tasse di vendita o analoghe tasse sui consumi (“Meccanismo di inversione contabile”). Se all’Imprenditore viene richiesto di pagare o trattenere eventuali tasse per pagamenti effettuati a cleverbridge, cleverbridge mantiene il proprio diritto a ricevere l’importo dovuto di cui al punto 6.1 per intero e senza alcuna detrazione. Al prezzo di vendita si aggiungerà l’importo delle tasse pagate o trattenute dall’Imprenditore (gross-up). L’Imprenditore fornirà a cleverbridge la documentazione che certifica che tutte le tasse dovute sono state pagate all’autorità fiscale competente entro 30 giorni dalla data del pagamento del prezzo di vendita. Ai fini connessi alla presente Clausola, per tasse si intendono tutte le imposte per la vendita, l’uso, gli introiti lordi, l’attività commerciale, l’occupazione e altre tasse (diverse da quelle sul reddito di cleverbridge) nonché tasse simili imposte da governi o pubbliche autorità ad eccezione dell’imposta sul valore aggiunto (IVA) riscossa da un membro dell’Unione Europea. La banca o l’emittente della carta di credito del Cliente potrà addebitare delle tariffe di servizio aggiuntive per pagamenti internazionali con carta di credito (“Tariffa per transazione estera”), laddove il Cliente effettui il pagamento in una valuta estera oppure ad un commerciante con sede in un altro Paese (ad es. cleverbridge in qualità di commerciante con sede in Germania). Gli addebiti e gli importi delle Tariffe per transazioni estere sono concordati individualmente tra le banche/le società emittenti delle carte di credito ed i Clienti. cleverbridge non ha alcuna conoscenza di tali accordi e, di conseguenza, non può fornire alcuna informazione su Tariffe per transazioni estere o altre tariffe o addebiti analoghi. LE PARTI CONCORDANO CHE, DI CONSEGUENZA, È ESCLUSA QUALSIASI RESPONSABILITÀ DA PARTE DI CLEVERBRIDGE PER LE TARIFFE PER TRANSAZIONI ESTERE ADDEBITATE, E CHE IL CLIENTE È IL SOLO ED ESCLUSIVO RESPONSABILE DEL PAGAMENTO DI TALI TARIFFE PER TRANSAZIONI ESTERE. 6.4. Nel caso in cui il Cliente scelga l’addebito diretto SEPA come metodo di pagamento applicabile, lo stesso sarà informato direttamente mediante una pre-notifica (“Pre-notifica”) dopo aver inoltrato l’ordine. L’importo verrà addebitato sul conto del Cliente nel giorno della Pre-notifica. Nel caso in cui il pagamento sia rifiutato o annullato, ad esempio in ragione di coordinate del conto errate o fondi insufficienti sul conto del Cliente, cleverbridge è autorizzata a fatturare ulteriori 10,00 Euro a titolo di rimborso per il lavoro ed i costi di transazione aggiuntivi. Tale tariffa non sarà addebitata nel caso in cui il Cliente dimostri che non è stata subita alcuna perdita oppure che la perdita è stata notevolmente inferiore rispetto alla tariffa di 10,00 Euro. cleverbridge avrà il diritto di richiedere il rimborso di effettivi costi superiori, presentando prove in tal senso. 6.5. In caso di un’eventuale anticipazione della fornitura (ordine di acquisto oppure acquisto rilasciando un ordine di addebito o un’autorizzazione di prelievo dal conto), i pagamenti devono aver luogo per l’intero importo, fatti salvi eventuali reclami per consegna in difetto o vizio del Prodotto. cleverbridge si riserva il diritto di cancellare qualsiasi ordine nel caso in cui il pagamento non sia completato entro 14 giorni. Qualora il pagamento sia effettuato con le seguenti modalità, il Cliente ha 14 giorni di tempo per concludere il suo ordine predisponendo il relativo importo: Boleto Bancário, Konbini, PayNearMe, bonifico bancario. cleverbridge si riserva la facoltà di annullare ordini il cui pagamento non sia effettuato entro 14 giorni. 6.7. Laddove cleverbridge ed il Cliente convengano di utilizzare cambiali o assegni come metodo di pagamento, il pagamento sarà considerato effettuato soltanto alla riscossione degli stessi. Le spese di sconto e d’incasso sono a carico del Cliente. cleverbridge non si assume alcuna responsabilità per la puntuale presentazione. Se in caso di acquisto su fattura questa prevede un termine di pagamento, il Cliente finisce in mora qualora, entro il suddetto termine, il pagamento completo del prezzo d’acquisto non sia stato accreditato su un conto di cleverbridge o non sia stato comunque diversamente ricevuto da cleverbridge. Tale disposizione si applica anche laddove il metodo di pagamento selezionato risulti insufficiente a coprire per intero l’importo entro tale scadenza. Laddove cleverbridge ed il Cliente abbiamo convenuto di utilizzare l’addebito diretto come metodo di pagamento, ciò si applicherà soltanto qualora cleverbridge abbia ragionevolmente tentato di addebitare l’importo sul conto bancario. In caso di mora del Cliente, questi dovrà corrispondere a cleverbridge interessi moratori in misura del cinque percento (5%) superiore al tasso di interesse di base, vigente al momento del verificarsi dello stato di mora. Nel caso in cui un Imprenditore finisca in mora, gli interessi di mora saranno pari a nove punti percentuali (9%) superiori al tasso di interesse di base. Il “tasso di interesse di base” indica un tasso di interesse variabile, fissato su scala semestrale dalla Deutsche Bundesbank, il quale, aumentato di un margine fisso, dà come risultato il tasso di interesse di mora (https://www.bundesbank.de/en/bundesbank/organisation/gtc-and-legal-basis/basic-rate-of-interest-616708). Senza limitazione di eventuali altri rimedi, cleverbridge si riserva il diritto di addebitare una penalità per ritardo su tutti i pagamenti insoluti equivalente all’uno e mezzo percento (1,5%) al mese del saldo insoluto oppure al tasso più elevato consentito dalla legislazione applicabile (considerando l’opzione corrispondente all’importo più basso). 6.11. In caso di mora, cleverbridge si riserva il diritto di annullare l’ordinazione e/o di reclamare il risarcimento dei danni. 7.1. Il prezzo per i Prodotti e Servizi è composto dal margine sulle vendite di cleverbridge, dai costi di acquisizione di cleverbridge per i Prodotti ed i Servizi e dalle tasse applicabili. Il margine sulle vendite copre i costi di cleverbridge per l’infrastruttura IT, il personale e l’elaborazione della transazione. Durante il periodo di validità di un Abbonamento, il quadro di riferimento per il calcolo del prezzo potrebbe cambiare da un Periodo di pagamento dell’abbonamento al successivo. Di conseguenza, nell’ambito della presente Clausola 7 le Parti concordano sull’esigenza e le procedure per la rettifica del Prezzo dell’abbonamento. 7.2. Qualsiasi tassa o diritto aggiuntivo imposto sulle vendite di Prodotti e Servizi sarà a carico del Cliente. Ciò si applica analogamente alle modifiche relative a tasse e diritti già fatturati al Cliente; cleverbridge è inoltre tenuta ad applicare abolizioni e riduzioni di tasse e diritti. 7.3. In base al presente contratto, cleverbridge adatterà i prezzi per i Prodotti ed i Servizi ai cambiamenti dei costi sostenuti da cleverbridge stessa o ai prezzi che cleverbridge è tenuta apagare per i Prodotti ed i Servizi, a sua ragionevole discrezione. Il prezzo potrebbe essere aumentato e sarà diminuito, ad esempio, nel caso in cui i costi di acquisizione per i Prodotti e i Servizi aumentino o diminuiscano, oppure laddove altri cambiamenti nel quadro di riferimento legale ed economico determinino un cambiamento dei costi (ad es. mediante un aumento dei costi per l’infrastruttura IT o l’elaborazione della transazione). Nel caso in cui i costi di una determinata tipologia crescano, ad esempio i costi di acquisizione, cleverbridge potrà aumentare il prezzo soltanto nella misura in cui non vi siano altre tipologie di costi in diminuzione. Nel caso in cui i costi di una determinata tipologia diminuiscano, ad esempio i costi di acquisizione, cleverbridge ridurrà il prezzo nella misura in cui lo stesso non sia controbilanciato da prezzi di un’altra tipologia in aumento. Esercitando la propria ragionevole discrezione, cleverbridge definirà la tempistica per la modifica del prezzo tale per cui le riduzioni dei costi abbiamo almeno lo stesso effetto sulla rettifica del prezzo degli aumenti dei costi. 7.4. cleverbridge informerà tempestivamente il Cliente di qualsiasi rettifica di prezzo, in maniera tale da consentire allo stesso di annullare l’Abbonamento prima della prima fatturazione con il prezzo rettificato. 8.1. La consegna della merce ordinata avviene conformemente alle rispettive informazioni di consegna presenti sul corrispondente Sito web di cleverbridge. 8.2. Per i Clienti che trasmettono il proprio ordine dagli USA, le date di consegna rappresentano soltanto delle stime. 8.3. Il termine di consegna concordato inizia a decorrere dalla ricezione del completo pagamento da parte di cleverbridge e dalla corretta comunicazione da parte del Cliente a cleverbridge, o al fornitore di servizi di pagamento scelto dal Cliente, di tutti i dati necessari per l’elaborazione dell’ordine. 8.4. I ritardi nella consegna causati da disposizioni di legge o di pubblica autorità (ad es. restrizioni all’importazione e all’esportazione) e dei quali cleverbridge non sia responsabile prolungano il termine di consegna corrispondentemente alla durata di tali impedimenti. Nei casi importanti, cleverbridge dovrà comunicarne senza indugio al Cliente l’inizio e la cessazione, sempre che la stessa cleverbridge ne sia a conoscenza. cleverbridge ha diritto di cercare di addivenire alla consegna del prodotto, con mezzi adatti e nei modi che le appaiano opportuni, a rischio e a spese del Cliente, o a conservare in magazzino il prodotto a rischio e a spese del Cliente. 8.5.2. cleverbridge è autorizzata a forniture parziali nei limiti del ragionevole. Nella misura in cui cleverbridge effettui delle consegne parziali agli Imprenditori, ciascuna consegna parziale rappresenterà un contratto separato e gli Imprenditori, in caso di non conformità di una o più forniture parziali, non sono legittimati a disdire le forniture parziali successive. 8.5.3. Il rischio di distruzione e deterioramento accidentale viene assunto dagli Imprenditori non appena il Prodotto viene ricevuto dalla persona incaricata del trasporto, al più tardi quando il Cliente ne entra in possesso. Riserva di proprietà cleverbridge si riserva la proprietà del prodotto fino al ricevimento del pagamento completo di tutti icrediti derivanti dal contratto, inclusi i crediti accessori (per es. spese cambiarie, spese difinanziamento, interessi, etc.). cleverbridge si riserva la proprietà del prodotto fino al ricevimento del pagamento completo di tutti icrediti derivanti dal contratto, inclusi i crediti accessori (per es. spese cambiarie, spese difinanziamento, interessi, etc.). 10.1. Nella misura in cui i Prodotti ed i Servizi consegnati da cleverbridge consistano in oppure comprendano un codice di attivazione, come descritto nella Clausola 1.5 (a), o in un Servizio, il Cliente accetta che l’utilizzo del Software corrispondente o, rispettivamente, la fornitura del Servizio corrispondente siano soggetti all’accettazione delle condizioni di utilizzo e di licenza del Fornitore (“EULA”). Il Cliente riceve l’EULA al momento dell’acquisto del Software o del Servizio. L’EULA può anche essere allegato al Software oppure comunicato al Cliente prima o durante l’utilizzo di un Servizio. Il Cliente prende atto che il Software o il Servizio può essere riprodotto, adattato, tradotto, messo a disposizione, distribuito, modificato, disassemblato, decompilato, ritradotto oppure combinato con altri software o Servizi, solo nella misura in cui è consentito espressamente dall’EULA e dalla legislazione applicabile. c)non accetta le condizioni di utilizzo e di licenza e non desidera utilizzare il Software o ilServizio sulla base di tali condizioni di utilizzo e di licenza, il Cliente può contattarecleverbridge e richiedere la restituzione degli importi pagati per il Software o il Servizio.cleverbridge può, a sua volta, richiedere la restituzione del Software o del Servizio acleverbridge (laddove possibile). In tal caso, tuttavia, il Cliente non avrà alcun diritto diutilizzare tale Software o tale Servizio. I dati dei Clienti sono soggetti ad elaborazione elettronica. Cleverbridge, laddove necessario,nell’osservanza di adeguate misure di sicurezza e nel rispetto delle prescrizioni di legge, inoltreràeventualmente dati personali al Fornitore dei Prodotti e dei Servizi acquistati dal Cliente, ai partner diservizio o alle imprese collegate, alcuni dei quali possono trovarsi al di fuori dello Spazio EconomicoEuropeo, inclusi gli USA. L’informativa sulla privacy completa di cleverbridge può essere visualizzataalla voce “Politica sulla privacy”. cleverbridge è legalmente responsabile soltanto della condizione adeguata dei Prodotti e dei Servizi,definiti alle Clausole 1.5 e 1.6. Poiché cleverbridge non vende il Software, la deroga alla relativaresponsabilità è indicata nelle Clausole 12.6.2 e 12.7.1. Le disposizioni delle Sezioni 12.1 – 12.6 si applicano soltanto ai Clienti che trasmettono il proprioordine da Paesi diversi dagli Stati Uniti. La Sezione 12.7 si applica soltanto ai Clienti chetrasmettono il proprio dagli Stati Uniti. 12.1. Tutte le indicazioni su Prodotti e Servizi di cleverbridge sono unicamente descrizioni e noncostituiscono alcuna garanzia. Un prodotto non è conforme se non possiede le caratteristiche concordate, non si presta all’utilizzo concordato o usuale e non presenta la qualità tipica riscontrabile in Prodotti simili e che l’acquirente può aspettarsi sulla base del tipo di Prodotto. Un prodotto è altresì non conforme laddove violi diritti di proprietà industriale, diritti d’autore o altri diritti di terzi. Sono determinanti le regolamentazioni tecniche e legali vigenti in Germania, salvo che non sia stato espressamente e diversamente convenuto. Servizi e prestazioni del Servizio sono ritenuti non conformi se non corrispondono agli accordi contrattuali. Gli Imprenditori hanno l’obbligo di controllare i prodotti nella misura usuale della prassi commerciale e di assicurarsi che non presentino difetti, che corrispondano alla descrizione del Prodotto e che siano completi. Si possono far valere i diritti basati sulla non conformità di un Prodotto o su una consegna in difetto, solo se il Cliente denuncia prontamente per iscritto o via e-mail a cleverbridge la non conformità e la consegna in difetto, purché ciò avvenga entro e non oltre cinque giorni dalla ricezione del Prodotto e, in caso di vizio nascosto, senza indugio dopo la presa conoscenza del relativo vizio nascosto. Si applica ad integrazione l’art. 377 del Codice commerciale tedesco [HGB]. 2) ovvero sostituire i Prodotti e Servizi non conformi con dei nuovi, esenti da vizi. 1) È escluso il diritto alla riduzione del rispettivo prezzo d’acquisto (riduzione). 2) Il diritto di recesso è limitato ai Prodotti e Servizi corrispondenti. 3) Se all’Imprenditore spetta il diritto di richiedere il risarcimento dei danni invece di ricevere la prestazione o recedere dal contratto, ovvero di richiedere una prestazione sostitutiva, cleverbridge può esortarlo ad esercitare i suoi diritti entro un congruo termine. L’Imprenditore comunicherà a cleverbridge la propria decisione in merito. Se l’Imprenditore non esercita i propri diritti entro un periodo ragionevole, al posto della prestazione può essere fatto valere il diritto al risarcimento dei danni o può venire dichiarato il recesso, soltanto qualora sia trascorso senza successo un ragionevole termine per l’adempimento successivo da parte di cleverbridge, stabilito dall’Imprenditore. 4) La garanzia per vizi dell’Imprenditore, in conformità alla Sezione 437 n. 1 e n 2 del BGB (Codice civile tedesco) si prescrive dopo dodici (12) mesi dalla consegna del prodotto. Laddove cleverbridge abbia effettuato o consegnato Prodotti o Servizi non conformi ad un Consumatore, quest’ultimo può scegliere se cleverbridge debba rimuovere il vizio mediante prestazione sostitutiva oppure se debba sostituire i Prodotti e Servizi non conformi con dei nuovi esenti da vizi. cleverbridge ha tuttavia il diritto di rifiutare il tipo di adempimento successivo scelto ove questo sia possibile solo a fronte di costi sproporzionati e, al contempo, l’altro tipo di adempimento successivo rimanga possibile senza considerevoli pregiudizi per il Consumatore. In caso di mancato adempimento successivo, il Consumatore può, in linea di massima, a sua scelta richiedere la riduzione del prezzo (riduzione) o recedere dal contratto. La garanzia per vizi del Consumatore si prescrive dopo ventiquattro (24) mesi dalla consegna del Prodotto. I Consumatori residenti in Francia possono reperire informazioni sui diritti aggiuntivi/in deroga al seguente link. Se il cliente esercita il diritto di recesso allo stesso spettante, le Parti contrattuali devono restituire l’una all’altra i Servizi ricevuti e gli eventuali guadagni percepiti. Contemporaneamente cessa il diritto di utilizzo del Cliente sui Prodotti e Servizi. Nel caso di Software precedentemente acquistato, il Cliente deve rimuoverlo immediatamente da tutti i dispositivi, i supporti di memoria e da tutte le parti integranti dei Prodotti e Servizi, nonché distruggere tutte le copie del Software eventualmente generate. Inoltre, il Cliente deve consegnare una dichiarazione separata (per iscritto, per fax o per e-mail) attestante che eseguirà le azioni di cui sopra. 12.6.1. È ESCLUSA LA RESPONSABILITÀ DI CLEVERBRIDGE PER CONSEGUENZE GENERATE DA MODIFICHE APPORTATE A PRODOTTI E SERVIZI DAL CLIENTE O DA TERZI, OVVERO DALL’USO IMPROPRIO O SCORRETTO DI PRODOTTI E SERVIZI. 12.6.2. CLEVERBRIDGE VENDE SOLTANTO I PRODOTTI E SERVIZI DEFINITI ALLE CLAUSOLE 1.5 e 1.6. DI CONSEGUENZA, È ESCLUSA LA RESPONSABILITÀ DI CLEVERBRIDGE RIGUARDO ALLA CIRCOSTANZA CHE LE FUNZIONI DEI SOFTWARE E DEI SERVIZI FORNITI DAI FORNITORI SODDISFINO LE SPECIFICHE RICHIESTE DEL CLIENTE O CHE I SOFTWARE E I SERVIZI PRESSO IL CLIENTE FUNZIONINO INSIEME AD ALTRE COMPONENTI IN UNA PARTICOLARE CONFIGURAZIONE HARDWARE. 12.6.3. SE NON DISPOSTO DIVERSAMENTE NEL PRESENTE PARAGRAFO 12.6, È ESCLUSA IN LINEA DI MASSIMA LA RESPONSABILITÀ DI CLEVERBRIDGE PER UN COMPORTAMENTO O UN’OMISSIONE. 12.6.4. QUALORA CLEVERBRIDGE VIOLI PER COLPA LIEVE UN OBBLIGO CARDINALE DEL CONTRATTO, LA RESPONSABILITÀ PER RISARCIMENTO DANNI DI CLEVERBRIDGE È LIMITATA ALL’INDENNIZZO DEI DANNI TIPICI CHE POTEVANO PREVEDIBILMENTE VERIFICARSI. GLI OBBLIGHI CARDINALI SONO QUELLI IL CUI ADEMPIMENTO È NECESSARIO PER IL RAGGIUNGIMENTO DEGLI SCOPI DEL CONTRATTO. 12.6.5. SE IL CLIENTE FA VALERE UNA RICHIESTA DI RISARCIMENTO DANNI BASATA SU DOLO O COLPA GRAVE DI CLEVERBRIDGE, OVVERO SULL’ASSENZA DI UNA DELLE CARATTERISTICHE ASSICURATE DA CLEVERBRIDGE, QUEST’ULTIMA RISPONDE NELL’AMBITO DELLE DISPOSIZIONI DI LEGGE. 12.6.6. RESTA IMPREGIUDICATA LA RESPONSABILITÀ DI CLEVERBRIDGE PER LESIONI COLPOSE ALLA VITA, ALL’INTEGRITÀ FISICA O ALLA SALUTE. LO STESSO VALE PER LA RESPONSABILITÀ PREVISTA DALLA LEGGE TEDESCA IN MATERIA DI RESPONSABILITÀ PER DANNO DA PRODOTTI. 12.6.7. L’EVENTUALE ESCLUSIONE O LIMITAZIONE DELLA RESPONSABILITÀ DI CLEVERBRIDGE VALE ANCHE PER LA RESPONSABILITÀ PERSONALE DEI SUOI IMPIEGATI, DIPENDENTI, COLLABORATORI, RAPPRESENTANTI E AUSILIARI. 12.7. Esclusione della responsabilità per i Clienti che trasmettono il proprio ordine dagli USABenché il Fornitore Possa offrire alcune garanzie per il proprio Software (o per alcuni dei propri Software), cleverbridge non offre alcuna garanzia sui Software acquistati mediante il Sito web di cleverbridge. CLEVERBRIDGE NON FORNISCE ALCUNA GARANZIA E DISCONOSCE QUALSIASI AFFERMAZIONE, GARANZIA E CONDIZIONE RISPETTO AL SOFTWARE, ESPRESSA O IMPLICITA, COMPRESE QUELLE RELATIVE A COMMERCIABILITÀ, ADEGUATEZZA PER UN IMPIEGO PARTICOLARE, TITOLO, NON VIOLAZIONE, INTEGRAZIONE DI SISTEMA, PIENO GODIMENTO ED ACCURATEZZA. 13.1.1. I Consumatori possono esercitare il diritto di recesso dal contratto senza dover fornire alcuna spiegazione entro quattordici (14) giorni. 13.1.2. Nel caso di contratto di prestazione di Servizi o di contratto per la fornitura di contenuti digitali acquistati singolarmente o a carattere periodico che non siano forniti tramite un mezzo materiale di supporto dati, il termine per l’esercizio del diritto di recesso è di quattordici giorni a partire dal giorno della conclusione del contratto. Nel caso di un contratto di vendita o di fornitura (per es. di cd per il back-up) il termine per il diritto di recesso è pari a quattordici giorni dal giorno in cui il Consumatore o un terzo nominato dal Consumatore, e che non sia nel contempo il trasportatore, abbia preso possesso dei beni. * né in contratti per la fornitura di registrazioni audio e video o di software per computer forniti in una confezione sigillata, ove la confezione sia stata rimossa dopo la consegna (art. 312g, comma 2 n. 6 BGB). LE DISPOSIZIONI DI CUI ALLA PRESENTE CLAUSOLA 13.2 SI APPLICHERANNO SOLTANTO AI CONSUMATORI CHE STIPULERANNO UN CONTRATTO PER LAFORNITURA DI UN CONTENUTO DIGITALE NON INSTALLATO SU UN SUPPORTO PER DATI FISICO. 2) È A CONOSCENZA DEL FATTO DI PERDERE IL PROPRIO DIRITTO DI RECESSO NEL MOMENTO IN CUI IL CONTRATTO COMINCIA AD ESSERE ESEGUITO. La presente Clausola non avrà effetto su alcuna garanzia di rimborso o qualsiasi altra garanzia analoga offerta da cleverbridge e regolata dalla Clausola 14. Al fine di esercitare il diritto di recesso il Consumatore deve informare cleverbridge (cleverbridge AG, Gereonstr. 43-65, 50670 Colonia, Germania, tel: +49 221 – 222 45 – 0, fax: +49 221 – 222 45 – 19, email: cs@cleverbridge.com) della sua intenzione di recedere dal contratto mediante una chiara dichiarazione in merito (per es. tramite lettera inviata via posta, fax o e-mail). Il Consumatore può (ma non ha l’obbligo di) utilizzare il seguente modello di dichiarazione o formula di recesso contenuto nella presente informativa sul diritto di recesso. Ai fini del rispetto del termine per l’esercizio del diritto di recesso è sufficiente la tempestiva spedizione della dichiarazione di recesso entro il termine previsto. 13.4.1. Nel caso in cui il Consumatore eserciti il diritto di recesso cleverbridge dovrà restituire tutti i pagamenti che ricevuti dal Consumatore, comprese le spese di spedizione (ad eccezione delle spese ulteriori derivanti dal fatto che il consumatore abbia scelto un modo di fornitura diverso dal più economico modo di fornitura standard offerto da cleverbridge), senza indugio ed al più tardi entro quattordici giorni dal giorno in cui cleverbridge abbia ricevuto la comunicazione del recesso dal presente contratto. Per effettuare la restituzione dei pagamenti cleverbridge utilizzerà lo stesso mezzo di pagamento scelto dal Consumatore per compiere la transazione originaria, a meno che con il Consumatore non sia stato espressamente concordato altro. In nessun caso il Consumatore dovrà sostenere dei costi connessi a tale restituzione. 13.4.2. Nel caso di un contratto per Servizi vale quanto segue: qualora il Consumatore avesse richiesto che i Servizi cominciassero ad essere prestati durante il periodo previsto per l’esercizio del diritto di recesso, il Consumatore dovrà corrispondere a cleverbridge un importo adeguato, corrispondente alla parte dei Servizi già eseguiti fino al momento in cui il Consumatore abbia informato cleverbridge dell’esercizio del diritto di recesso relativamente al presente Contratto, tenuto conto della misura complessiva dei Servizi previsti dal contratto. 13.4.3. Nel caso di un contratto di vendita o di fornitura di beni vale quanto segue: cleverbridge può rifiutare la restituzione del pagamento fino al momento in cui riceve indietro i beni o il Consumatore fornisce la prova di avere rispedito i beni, considerando l’evento che si verifica per primo. Il Consumatore deve rispedire o riconsegnare a cleverbridge i beni senza indugio e, in ogni caso, al più tardi entro quattordici giorni dal giorno in cui il Consumatore informa cleverbridge relativamente al recesso dal presente contratto. Il termine si intende rispettato se il Consumatore spedisce i beni prima della scadenza del termine di quattordici giorni. Le spese direttamente connesse alla rispedizione dei beni sono a carico del Consumatore. Per il deterioramento del valore dei beni il Consumatore è tenuto a un risarcimento se tale diminuzione di valore può essere ricondotta ad un utilizzo non necessario ai fini del controllo della qualità, della proprietà e del funzionamento degli stessi beni. (Qualora si intenda recedere dal contratto si prega di riempire questo modulo e di rispedircelo). (*) cancellare quanto non pertinente. Per alcuni Prodotti e Servizi cleverbridge offre una garanzia di rimborso soltanto nella misura indicata sul Sito web di cleverbridge. A fronte di tale garanzia, i Clienti possono richiedere un rimborso del prezzo di acquisto con la stessa modalità con cui possono esercitare il diritto di recesso in conformità alla Clausola 13.3. La richiesta di rimborso è valida soltanto se è stata ricevuta da cleverbridge nell’ambito del periodo indicato sul Sito web di cleverbridge. 15.1. I Clienti possono annullare gli Abbonamenti a Prodotti e Servizi nella misura indicata sul Sito web di cleverbridge. L’annullamento diverrà effettivo soltanto a partire dalla data di scadenza del Periodo di abbonamento in corso di validità in tale momento. 15.2. cleverbridge può cancellare l’Abbonamento sulla base delle stesse condizioni del Cliente. 15.3. L’utilizzo di Prodotti e Servizi venduti da cleverbridge può dipendere da piattaforme online gestite dal Fornitore, da dati elaborati dal Fornitore e dalla capacità del Fornitore di fornire i Servizi. Laddove il Fornitore interrompa completamente o parzialmente il servizio della rispettiva piattaforma online, interrompa l’elaborazione dei dati o la fornitura dei rispettivi Servizi (“Cessazione” cleverbridge avrà il diritto di cancellare l’Abbonamento con effetto a partire dalla data di Cessazione. cleverbridge rimborserà il Cliente in maniera proporzionale per la durata del Periodo di abbonamento restante in seguito alla Cessazione. Per i contratti con Imprenditori, come luogo di adempimento per consegne e pagamenti si conviene la sede di cleverbridge, ossia Colonia, in Germania. I clienti possono contattare cleverbridge per e-mail all’indirizzo cs@cleverbridge.com per risolvere qualsiasi disputa e/o reclamo. I clienti che trasmettono il proprio ordine da uno Statomembro dell’Unione europea possono reperire delle informazioni generali sugli obblighi ed i meccanismi relativi alla risoluzione delle controversie online qui. cleverbridge non prende parte a procedimenti di liquidazione stragiudiziale innanzi ad organismi di risoluzione delle dispute. Per i contratti con Consumatori, il foro di giurisdizione generale viene stabilito conformemente alla legislazione tedesca. Il presente contratto sarà interpretato e regolato in tutti i suoi aspetti in conformità alla legislazione della Germania. Non trovano alcuna applicazione le disposizioni della Convenzione ONU di Vienna sui contratti di compravendita internazionale di merci dell’11.04.1980 (la Convenzione di Vienna). Per tutti i procedimenti e/o conflitti legali derivanti dal presente contratto o relativi allo stesso sarà competente esclusivamente il foro di Colonia, Germania. Il presente contratto sarà interpretato e regolato in tutti i suoi aspetti in conformità alla legislazione della Germania. Per gli ordini effettuati da Consumatori che abbiano la dimora abituale al di fuori della Repubblica Federale di Germania restano valide e continuano ad applicarsi rispettivamente le disposizioni di legge in vigore e la tutela riconosciuta in via cogente tramite il diritto giudiziale nel relativo Paese di soggiorno. Non trovano alcuna applicazione le disposizioni della Convenzione ONU di Vienna sui contratti di compravendita internazionale di merci dell’11.04.1980 (la Convenzione di Vienna). * le controversie insorte dopo la cessazione di qualsiasi accordo tra le Parti. Nonostante quanto sopra esposto, entrambe le Parti possono promuovere singole cause davanti a tribunali competenti per procedimenti small claims (ovvero per le controversie di modesta entità). Con l’accettazione delle presenti condizioni contrattuali, il Cliente acconsente a rinunciare alla promozione di procedimenti davanti a corti d’assise e a partecipare ad azioni collettive. Il rapporto tra le Parti è costituito da una transazione di commercio internazionale e, corrispondentemente, il Federal Arbitration Act (Legge sull’arbitrato federale degli USA) regola l’interpretazione e l’esecuzione della presenteclausola. La presente clausola di arbitrato resta in atto anche dopo la cessazione del contratto concluso dalle Parti. 17.2.2. La Parte che promuove la procedura arbitrale deve previamente far recapitare per raccomandata e per iscritto alla controparte un Atto di chiamata in causa (di seguito “Chiamata in causa”). La Chiamata in causa deve essere notificata a cleverbridge al seguente indirizzo: cleverbridge AG, Gereonstr. 43-65, 50670 Colonia, Germania (di seguito “Indirizzo per le notifiche”). La Chiamata in causa deve (a) descrivere la natura e l’oggetto del diritto di credito o della controversia; e (b) rappresentare la concreta domanda giudiziale (in seguito “Richiesta di risarcimento”). Se cleverbridge e il Cliente non giungono a un’intesa sulla composizione della controversia entro trenta (30) giorni dalla notifica della Chiamata in causa, il Cliente e cleverbridge possono avviare una procedura arbitrale. Durante la procedura, l’arbitro non rivela l’ammontare delle eventuali offerte per la composizione della controversia fatte da cleverbridge o dal Cliente, fino a quando l’arbitro non ha deciso l’ammontare della prestazione alla quale il Cliente o cleverbridge sono obbligati. Il cliente può scaricare o copiare il modulo per la Chiamata in causa. 17.2.3. Dopo che cleverbridge ha ricevuto al suo Indirizzo per le notifiche la comunicazione dell’apertura di una procedura arbitrale da parte del Cliente, cleverbridge rifonderà immediatamente al Cliente le spese da questi sostenute per l’avvio del procedimento arbitrale. Se il Cliente non è in grado di corrispondere i costi, cleverbridge li pagherà direttamente dopo il ricevimento della relativa richiesta scritta all’Indirizzo per le notifiche. La procedura arbitrale sarà regolata dalle norme delle Commercial Dispute Resolution Procedures (Procedure per la risoluzione delle controversie commerciali) e delle Consumer Related Disputes (Procedura integrativa per le controversie relative ai consumatori) (congiuntamente, nel prosieguo, “Norme AAA”) della American Arbitration Association (Camera arbitrale americana) (di seguito “AAA”), che sono state emendate dalle presenti condizioni contrattuali e sono amministrate dalla AAA. Le Norme AAA sono disponibili online alla pagina www.adr.org, telefonicamente presso la AAA al numero 1-800-778-7879 o tramite richiesta scritta all’Indirizzo per le notifiche. Tutti i punti della controversia vengono lasciati alla decisione dell’arbitro, incluso l’ambito della presente clausola di arbitrato; l’arbitro è però vincolato alle disposizioni delle presenti condizioni contrattuali. Se non diversamente concordato congiuntamente da cleverbridge e dal Cliente, i colloqui di conciliazione si svolgono nel distretto (o nel comune) dell’Indirizzo di fatturazione del Cliente. Se l’importo reclamato dal Cliente ammonta a diecimila dollari USA (USD 10.000,00) o meno, cleverbridge concede al Cliente il diritto di decidere se il procedimento arbitrale si dovrà svolgere esclusivamente sulla base dei documenti trasmessi all’arbitro attraverso un’audizione telefonica, o sulla base di un’audizione personale secondo quanto stabilito dalle Norme AAA. Se l’importo reclamato dal Cliente supera i diecimila dollari USA (USD 10.000,00), il diritto all’audizione viene stabilito secondo le Norme AAA. Ove non diversamente previsto dalle presenti condizioni contrattuali, cleverbridge provvede al pagamento di tutti i costi per l’apertura, lo svolgimento e l’arbitro della procedura presso la AAA o di un’altra procedura arbitrale, se questa soddisfa i requisiti degli obblighi di notifica sopra citati. Qualora tuttavia l’arbitro constati che il contenuto della controversia o della domanda giudiziale sia vessatorio o sia stato perseguito per scopi illegittimi (secondo la valutazione basata sulle condizioni illustrate nel Federal Rule of Civil Procedure (Codice federale di procedura civile) 11(b)), l’assegnazione dell’obbligo del pagamento di tutti i costi ha luogo secondo le Norme AAA. Il Cliente acconsente in questo caso a rimborsare a cleverbridge tutte le spese precedentemente anticipate dalla stessa e che, conformemente alle Norme AAA, in caso contrario rientrano nell’obbligo di pagamento del Cliente. * all’avvocato del cliente, laddove ne abbia uno, il doppio dell’onorario dell’avvocato stesso e gli rifonderà tutte le congrue spese sorte durante il procedimento arbitrale per l’esame, la preparazione e l’attuazione delle richieste di risarcimento del Cliente (di seguito chiamato “premio per l’avvocato”). Qualora cleverbridge non abbia presentato alcuna offerta scritta per la composizione della controversia precedentemente alla designazione di un arbitro, il Cliente e il suo avvocato hanno il diritto di ricevere rispettivamente il premio e il premio per l’avvocato, se l’arbitro riconosce al Cliente il petitum della domanda giudiziale. L’arbitro può in qualsiasi momento durante il procedimento e, su richiesta di una delle Parti, entro quattordici (14) giorni dalla sua decisione sulla causa, adottare provvedimenti e risolvere conflitti connessi con il pagamento e il rimborso dei costi, delle spese, dei premi e dei premi per l’avvocato. 17.2.5. La richiesta di risarcimento dell’onorario dell’avvocato e delle spese legali illustrate nel comma 17.2.4 integrano qualsiasi diritto al pagamento dell’onorario dell’avvocato e delle spese legali spettanti al Cliente secondo il diritto vigente. Se, ai sensi del diritto vigente, al Cliente viene riconosciuto un importo maggiore, la presente clausola non esclude di conseguenza che l’arbitro gli assegni l’importo maggiore. Il Cliente non può tuttavia ricevere un rimborso pari al doppio dell’onorario dell’avvocato e delle spese legali. Benché cleverbridge, in base ad alcune legislazioni in ambito di procedimenti arbitrali, possa avere diritto al pagamento dell’onorario dell’avvocato e delle spese legali, cleverbridge accetta di non fare valere tali diritti. 17.2.6. L’arbitro può pronunciare azioni inibitorie a favore della Parte che ha avanzato la domanda giudiziale e, questo, solo nell’ambito di quanto necessario per soddisfare la domanda giudiziale della Parte conformemente alla richiesta. IL CLIENTE E CLEVERBRIDGE CONVENGONO CHE CIASCUNA PARTE PUÒ AVVIARE CONTROVERSIE VERSO L’ALTRA PARTE SOLO IN QUALITÀ DI CLIENTE O SOGGETTO SINGOLO E NON COME ATTORE O ATTORE COLLETTIVO IN UN POSSIBILE PROCEDIMENTO COLLETTIVO. Se non diversamente stabilito di comune accordo dal Cliente e cleverbridge, l’arbitro può inoltre soltanto riassumere le richieste di credito di un singolo soggetto, ma non può presiedere in qualsivoglia forma un procedimento collettivo. Laddove la presente disposizione si rivelasse inapplicabile, l’intera clausola di arbitrato sarà nulla. Le presenti CGC contengono il contratto complessivo tra le Parti riguardante le dinamiche illustrate e sostituiscono tutti i contratti, le comunicazioni e gli accordi precedenti o contemporanei tra le Parti (sia scritti che orali) concernenti la tematica ivi contenuta. Modifiche e integrazioni alle presenti CGC necessitano della forma scritta. L’obbligatorietà della forma scritta può essere derogata solo per iscritto. Qualora una disposizione sia o dovesse divenire inefficace nel quadro delle presenti CGC o di altri accordi, ciò non pregiudica l’efficacia di tutti gli altri accordi e delle altre disposizioni. In vece della disposizione inefficace si applicherà la corrispondente norma di legge. Supported operating systems: Windows 7 SP1, Windows 8.0, 8.1 or Windows 10. * Minimum configuration means just that: You will be able to install and run the program. You will be able to perform all basic functions and work with text and multimedia files. But please do not expect to work with larger or a great number of multimedia files or to run auxiliary applications in parallel. ** Bigger is better! The more available resources (especially RAM and processor power) your system has, the more comfortably and smoothly will you be able to work with ATLAS.ti. For work with multimedia material, embedded content, or for running auxiliary applications we strongly recommend PC systems of a solid mid- to upper-level capacity. ATLAS.ti Mac runs on any Mac with OS version 10.8 ‘Mountain Lion’ or higher. There is NO native Unix/Linux version of ATLAS.ti. — Please look into software that lets you create a virtual or simulated Windows PC environment on your Unix computer. Make sure you have enough system resources (especially RAM, processor speed) left for smooth operation. 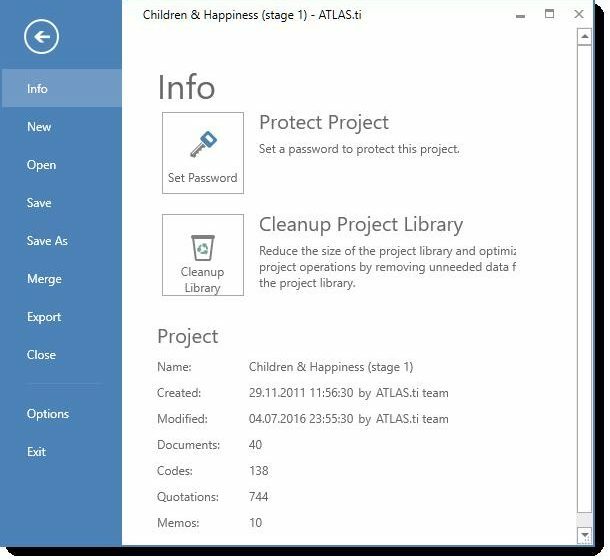 Transfering projects created in previous versions to Atlas.ti 8 for Windows. Software per l’analisi qualitativa di dati non strutturati.